Best Vitamin Supplement for Diabetes Type 2 with Natural Herbs. Help Lower, Control or Maintain Normal Range of Blood Sugar Levels Naturally. SugarBalance is the best vitamin supplement for diabetes type 2 that naturally helps lower blood sugar / high glucose level without the use of insulin. This herbal treatment is a proprietary complex that features a synergistic, multi-nutrients approach of best vitamins, minerals, and effective herbs for diabetes for blood sugar levels control. SugarBalance formula is a new alternative treatment for diabetes type II that could reduce your sweets craving and controlling healthy glucose level. It will eat diabetes naturally. According to the American Diabetes Association, there are approximately 54 millions adults in the U.S. have pre-diabetes (normal range of fasting diabetes blood sugar level is between 100 and 125 mg/dL). Normal fasting blood sugar count is how much sugar in the blood at morning time. Type 2 diabetes have a fasting blood-glucose read of 126ml/dL or higher in which the body does not produce enough insulin or fails to use it properly. Pre-diabetes patients in this borderline period could increase the chance of developing the number-one killer heart disease (hardening of the arteries), Therefore, controlling and lowering blood sugar / glucose is an important mission for borderline diabetic people to reduce the risk of full blown diabetes. Type II or non-insulin dependent diabetes occurs when cell walls resist to insulin that raise the insulin level higher in order to move glucose out of the bloodstream and into the resisting cells. "Young adults with diabetes have rates of coronary heart disease 12 to 40 times higher than those people without"
Do not waste your money on any other natural diabetes type II treatments that have minimal effectiveness. SugarBalance is guaranteed to control and maintain healthy blood sugar glucose levels or you get your money back! 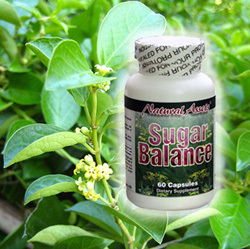 SugarBalance herbal diabetes treatment is formulated with top quality vitamins, minerals, and herbs for high blood sugar / glucose level. All products are produced under FDA approved manufacturing plant in the USA. Our natural diabetes medicine offers potent standardized or concentrated extracts of natural herbs to make sure that our customers receive consistent and effective benefits from the active nutrients of the herbs' while maintaining the herbs' traditional characteristics that help lower high blood sugar naturally. Numerous scientific researches have concluded that diabetes 2 can be naturally cured with a healthy lifestyle adjustment, proper diet, and effective nutritional supplements. Without the use of insulin, SugarBalance promotes safe & normal range of blood glucose level while lower your appetite for sweets. Controlling blood sugar level is important in the healing and reducing the risk of full blown type 2 diabetes. SugarBalance promotes healthy pancreatic function by blocking the absorption of blood glucose in the intestine and preventing adrenal hormones from signaling the liver to produce glucose. With increased production over time, stress on the pancreas is relieved which allows it to naturally heal and develop new beta cells with a different signature. These new beta cells are not susceptible to the body's immune system malfunction since they can not be targeted. effective by reducing fast blood sugar levels. The studies also reported no side effects from taking this amazing herb. All of our vitamins and natural ingredients are top quality and certified for safety and potency. Furthermore, some of this complex's natural blood sugar lowering foods, nutrients & herbs are manufactured and extracted to provide at least 4 to 20 times higher potency than regular herbs. But there are more.....some of our ingredients are further processed to contain the only standardized ACTIVE nutrient that makes the herb more powerful. An example is our Gymnema Extracts that's guaranteed to contain minimum 25% gymnemic acids, the active nutrient that gives Gymnema its great effectiveness for a healthy heart. This proprietary complex has a proven history of providing healthy benefits effectively and efficiently. Mormordica Charantia is also known as bitter melon and a proven & effective natural treatment of diabetes. This bitter melon herbal extract features an active nutrient polypeptide that may help enhance glucose tolerance, decrease glucose formation from the liver, and encourage insulin emission, . Bitter melon is recommended by Philippines' Ministry of Health as one of the best herbal medicines for glucose level management for people with adult-onset diabetes. In the US, there are over 7% or 20 million people with diabetes. Each year 3 million deaths are from diabetes. Over the next decade, It anticipates that death rate would rise 25 percent. Order this Diabetes Cure Without Risk Today! Fenugreek, rich is dietary fiber, is one of the popular herbs for diabetes. This vegetable is from India and features many anti-diabetic properties and potential to be a type 2 diabetes natural herbal cure. In recent clinical studies with diabetic patients, Fenugreek have shown promising benefits to lower blood sugar level and improve the release of insulin. IFurthermore, these seeds also help in balancing digestion and lowering high cholesterol levels linked to diabetes. Ginseng is one of the effective diabetes healing foods and has been studied to have hypoglycemic effects as it helps lowering blood sugar. Insomnia was reported as a minor side effect. Deficiency of Magnesium is common in diabetes patients. Magnesium may help oxidizing blood glucose and increase insulin emission as various clinical studies have reported a decrease in fasting blood sugar level and increase in insulin after eating. Vanadium is a trace element that could be an alternative treatment for diabetes as it may help oxidizing blood glucose. Several clinical studies of vanadium have shown decrease in insulin intake and a positive changes in insulin sensitivity with minor side effect in the stomach and intestines. Deficiency of Vitamin C is common in diabetes patients. Studies have shown that Vitamin C help to improve insulin resistance and glycemic control. Order your SugarBalance Without Risk Today! Controlled clinical trials in Vitamin E intake in diabetics has reported better glycemic control, increase in insulin sensitivity while decrease in blood glucose oxidation. Eat two or three reasonable meals and several small snacks a day. Minimize processed foods. Consume foods that are low in sodium, saturated fats & trans fats, and high in vegetables, fruits, whole grains with low-fat or nonfat diary products. Loose excess weight. Go slow - taking off even a little weight can often boost heart health. Consider weight loss as a long-term proposition. Diabetes and Herbs - Take herbal supplements to naturally reduce diabetes blood sugar level and maintaining diabetes health. In a Diabetes Prevention Program study by the George Washington University in Maryland, overweight people with pre-diabetes who exercised for at least 150 minutes per week and lost 7 percent of the their body weight lowered their risk of developing full-blown diabetes by 58 percents. Recommended Use: As a dietary supplement for adults. Take one capsule with meals, three to four times daily. We are certain that this high quality & potent formula will provide the desired results. If you are not 100% satisfied for any reasons, simply return the empty product or unused portion within 30 days we will quicktly refund the purchased price with no questions asked (excluding shipping/handling).